Of John's brothers and sisters, all were born and died in Sheffield, Yorkshire with the exception of Harold, who died in Scarborough, Yorkshire. For most of his time in Sheffield, occupations listed generally had something to do with engineering. On 1 August 1910 he married Sarah Ann "Sally" TIPLER at Attercliffe Baptist Church in Sheffield. To see more about John Arthur MARRIOTT and his wife Sarah Ann "Sally" TIPLER's ancestors, click here. Sarah Ann "Sally" TIPLER was born on 15 April 1885 in Sheffield, Yorkshire, England to John TIPLER and Ann "Annie" LEE. 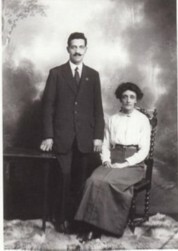 She has one step brother, William Goddard LEE who was born on 26 November 1881 in Nottingham. The father of William has not been verified. On 31 March 1920 the family sailed from Southhampton on the steam ship "Ionic" arriving in Auckland, New Zealand and stayed for a while in Oamaru with other family members already in New Zealand. The family members that they stayed with were William LEE (Sarah Ann's Uncle) and his wife Elizabeth (nee AKERS. William and Elizabeth, along with William's brother arrived together in New Zealand in 1879. Sarah Ann's mother, Annie arrived in New Zealand in Auckland on 1 October 1921 on the ship "Remuera" which had departed England on 18 August 1921. Annie first moved to Marton where her brother Ellis was living at that time. Later on she moved in with her grand daughter, Constance Ivy in Masterton. John found work as an engineer with the New Zealand Railways near Stratford where they had twins born on 15 December 1923, Maurice Rex and Muriel Evelyn. John died 27 February 1964 in Masterton and is buried in the Kelvin Grove Cemetery in Palmerston North. Sarah Ann died on 31 January 1955 in Palmerston North and is buried with her husband. While in England Constance attended school at Huntsman Garden Board School on Bodmin Road at later went to Huiakama near Stratford in Taranaki, New Zealand from 1920 to 1925. She left school in 1925 having gained a Competency Certificate in Standard 5. Later she married Leonard COLEY at Palmerston North Baptist Church on 2 November 1937. Constance and Leonard never had any children. She died on 15 October 1975 in Palmerston North and is buried in the Kelvin Grove Cemetery in Palmerston North. Leonard was born 24 June 1898 in Palerston North and died on 24 April 1968 in Foxton, New Zealand. While in England Kenneth attended school at Huntsman Garden Board School on Bodmin Road at later went to Huiakama near Stratford in Taranaki, New Zealand from 1920 until 1926 when he passed the Proficiency Exam in Standard 6 and started at New Plymouth Boys High School the next year. He married Keitha Mary WHITFORDon 27 August 1939 at the Blenheim Presbyterian Church. Keith was born on 2 August 1917 in Blenheim. Keitha died on 2 october 1998 at Whangaparoa, Auckland, New Zealand and Kenneth died there on 13 June 2001. Both were cremated with their ashes scattered at Lyttleton, New Zealand. They had four children (one was still born). There are now a number of grandchildren and one great grand child. Raymond's schooling started at Huiakama School, near stratford in Taranaki where he attended from 1922 until 1927. From 1927 until 1934 he was at Shannon School then went to Levin District High School (while still living in Shannon). He first met his wife, Esther Mary HOWES in Western Samoa during World War II where she was a nurse. They married on 15 April 1947 at the Presbyterian Church in Albury, near Timaru in New Zealand. Raymond became a Police Officer with the New Zealand Police and served at a number of stations which included Addington, Albury, Greymouth, Lyttleton, Mt Albert, New Lynn, Riccarton, Te Kuiti, and Stewart Island. He retired sometime in the 1970's gaining the rank of Senior Sergeant at Palmerston North. He died on 18 March 1993 at Levin. Esther, his wife died on 29 October 2008. There are five children, eleven grandchildren and six great grand children. Duglas started school at Marton in 1926 but only stayed there one year before going to Huiakama School but only stayed there for several months before going to Shannon School. He then went to Palmerston North Tech School in 1932. He became a pilot in the New Zealand Air Force, gaining the rank of Flight Leuitenant. Douglas married Vera BILLINGTON (nee EASTHAM) at the Kensington Register Office in London on 10 March 1945. He died on 18 May 1951 in Christchurch, New Zealand and is buried in the Linwood Cemetery. His wife, Vera died about 1994 in England. There is one son. For his schooling, Maurice went to Shannon School from 1929 until 1934 when he went to a high school in Palmerston North. Maurice married Thelma Joyce "Joy" JOHNSON on 14 September 1946 in Auckland. Thelma was born on 30 June 1923 in Auckland. He died on 9 February 1989 in Opotiki and his wife died there on 25 January 1989. There are three children, a number of grandchildren and several great grandchildren. Muriel went to School from 1929 until 1934 when she moved to Palmerston North. Sometime in 1949, she married Harold ALLINGTON in Christchurch. Harold was born about 1922. Murial died on 8 December 1972 in Christchurch and is buried in the Linwood Cemetery. Her husband, Harold died about 1971 in Christchurch. There are four children and several grand children.